Time to put your stretchy pants on. Remember that picture in my go-to pizza dough post? This is where I tell you what was on that pizza dough. This pizza is a dream. We like to make it for company because it is so outrageous that we want everyone to try it. A little disclosure: I never used to like cheeseburgers that much. Or beef at all, really. But something about hanging out with a cheeseburger obsessed guy makes you wonder what all the fuss is about, and one day I asked for a bite. Then I took another one, and I kinda liked it. A lot. Then we got a Five Guys, otherwise known as the holy grail of burgers. And before you know it, this “I really only eat beef a few times a year and don’t even really like it that much” girl was full out cheeseburger obsessed too. My cheeseburger phase then collided with my pizza making phase and then this happened. You have to make this, you guys. It is so ridiculous, in the best way possible. Preheat oven to 500 degrees. Line two cookie sheets with parchment paper and drizzle with olive oil. Divide dough into two balls and stretch each out to fit the cookie sheets. Set aside. Cook bacon until cooked but not crisp (I love to do this on a baking sheet in the oven for ease). Let cool, and then coarsely chop. Set aside. Add olive oil to a large skillet over medium heat. Add onion and cook until translucent. Add ground beef and cook until brown. Drain if necessary. Add back into pan and season with seasoning salt. Remove from heat. In a small bowl, combine ketchup and mustard, stirring well. Spread sauce evenly on each pizza. Sprinkle each pizza with 1.5 cups of cheese. 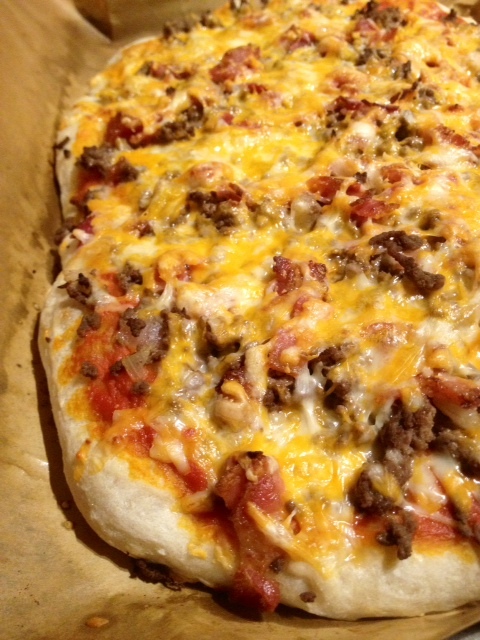 Divide beef mixture evenly between the two pizzas, then the bacon. Finish each pizza with 1.5 cups of the shredded cheese. Bake for about 15 minutes, until pizzas are crisp and cheese is bubbly, then broil for a couple of minutes to crisp up the top if needed. Cool for a few minutes to set, then slice and devour.